Slowly and softly feel yourself arrive more fully into your body and heart through this sweet, slow restorative workshop. Tend to the self in a deeply relaxed state to set the tone for the weekend. Backbending doesn’t need to hurt or stress the body. Learn key principles to help sustain your current backbending practice or to progress it by connecting to your core. Hip openers and twists can help us go deep and settle ourselves from within. Strengthen while you stretch, and begin to build awareness, understanding, and compassion around the layers of tension we hold. Come practice in a full spectrum class. By practicing a variety of poses in one class – including breathing and meditation, we will integrate our learning so that we leave feeling whole. 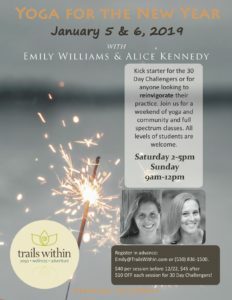 To register, please contact Emily at emily@trailswithin.com or (530) 836-1500. 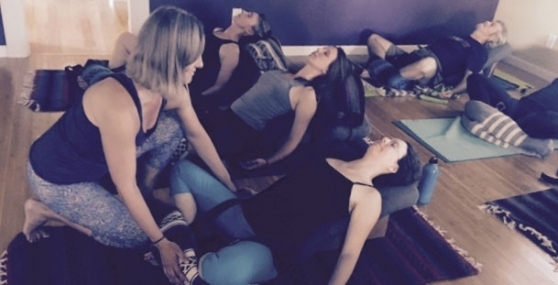 Let yourself be fully nurtured in this healing three hour restorative workshop. By gently resting in supportive yoga postures, we can help reset the nervous system so that your body’s natural wisdom can guide the way into deep rest and relaxation. Expect to unwind from the busy nature of the season so that you can restore yourself to health, healing, and a true sense of calm. Yoga offers us each an opportunity to bolster ourselves from within, to fill ourselves up so that we are then able to live our lives from a place of fullness instead of from a place of lack. Though the world around us is tumultuous and changing, the philosophy behind this ancient tradition of yoga teaches us that we can find deep peace, ease and connection within, regardless of the storms that may rage around us. 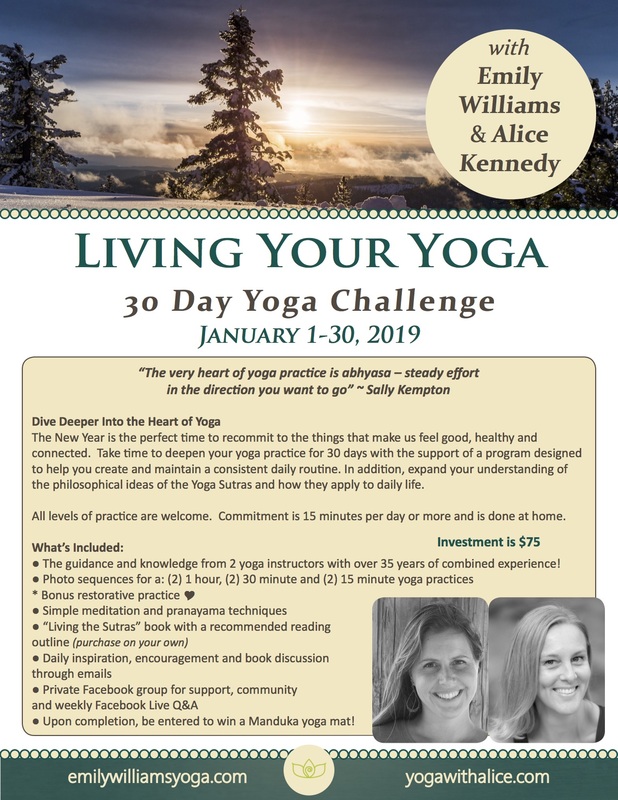 We hope that this 30 Day Yoga Challenge is a way to deepen your own understanding of the path of yoga, and for you to feel into the many benefits that a daily practice can offer to your heart, mind, body and spirit. The New Year is the perfect time to recommit to the things that make us feel good, healthy and connected. 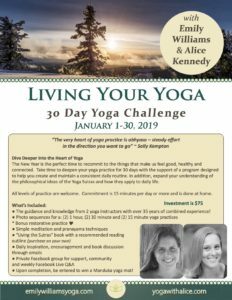 Take time to deepen your yoga practice for 30 days with the support of a program designed to help you create and maintain a consistent daily routine. In addition, expand your understanding of the philosophical ideas of the Yoga Sutras and how they apply to daily life. All levels of practice are welcome. Commitment is 15 minutes per day or more and is done at home. ● The guidance and knowledge from 2 yoga instructors with over 35 years of combined experience! ● Upon completion, be entered to win a Manduka ProLite yoga mat! Your spot is not guaranteed unless you prepay for it. Cancellations 7 or more days prior to start of the program will receive a full refund, minus a $5 service fee. For cancellations less than 7 days before the program, we will only be able to issue a refund if you are able to find a replacement for your reserved space. Cancellations within 48 hours of the start of the program or if you leave the program early for any reason, no credit or refund is available. “I am so happy about participating in this 30-day yoga challenge! The main impacts that I have noticed are: Physically, I feel great – stronger and less pain & Emotionally, I am not trying to have everything be perfect (which it never is) at my house/ in my life before I do yoga! Before this challenge, I would start doing yoga and then, with my first down dog, I would see that I absolutely HAD to vacuum. And then I’d put a load of laundry in between sun salutations. And etc. I realize that my life isn’t perfect (or how I expect it to be) when I go to class, but going to class has always meant LETTING GO of the mess (that is life) for just a while and then returning to it afterwards. “Thanks to you for taking us all down this road. I can feel the mat calling to me now when its time, and I look forward to the peace and alone-time that the practice offers. The practice has improved my daily outlook in general and has helped me to loosen some of these stiff muscles that have been so tight for years. Though I have a long way to go, I am very pleased that I have incorporated more yoga into my daily life and I appreciate all of the mind and body rewards that it offers. Kickstarter for the 30 Day Challengers or for anyone looking to reinvigorate their practice. 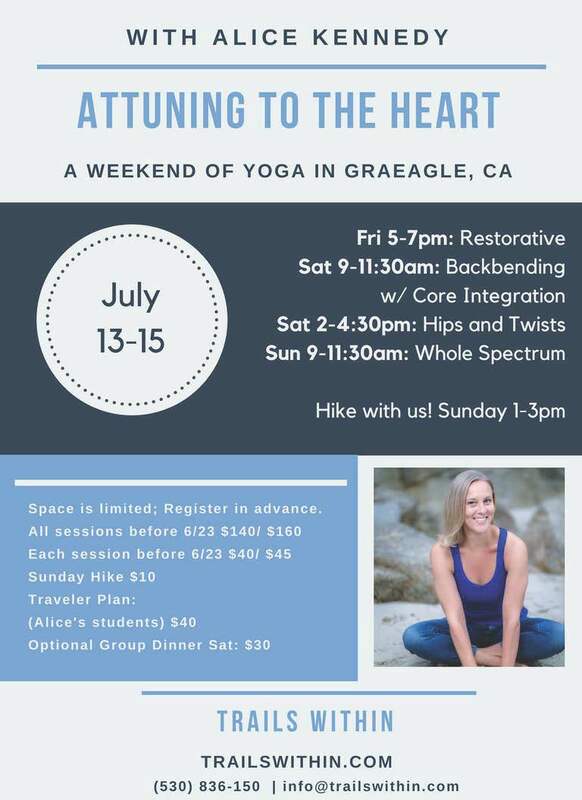 Join us for a weekend of yoga and community and full spectrum classes. All levels of students are welcome. 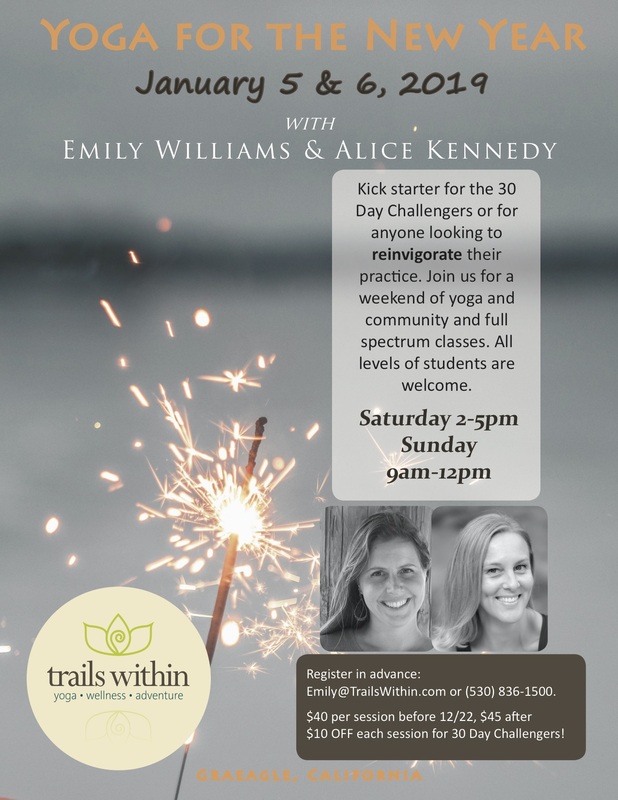 Register in advance: Emily@TrailsWithin.com or (530) 836-1500. $10 OFF each session for 30 Day Challengers! Give of your practice. Step out of the yoga studio, onto the sand, and align your yoga in support of a world safe from violence and abuse. I’ll lead the asana practice for this event, in support of Monarch Services, an organization that has provided safe refuge in the Santa Cruz community for over 40 years. 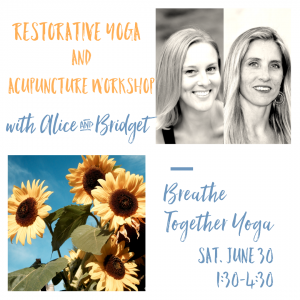 Join Alice and Bridget for this one-of-a-kind experience through a joint restorative and acupuncture workshop. Even if you have no experience with acupuncture or restorative yoga, this workshop is perfect for anyone feeling over-stimulated, heated, or disconnected, all very common during the summer months, especially in the mid-summer heat. 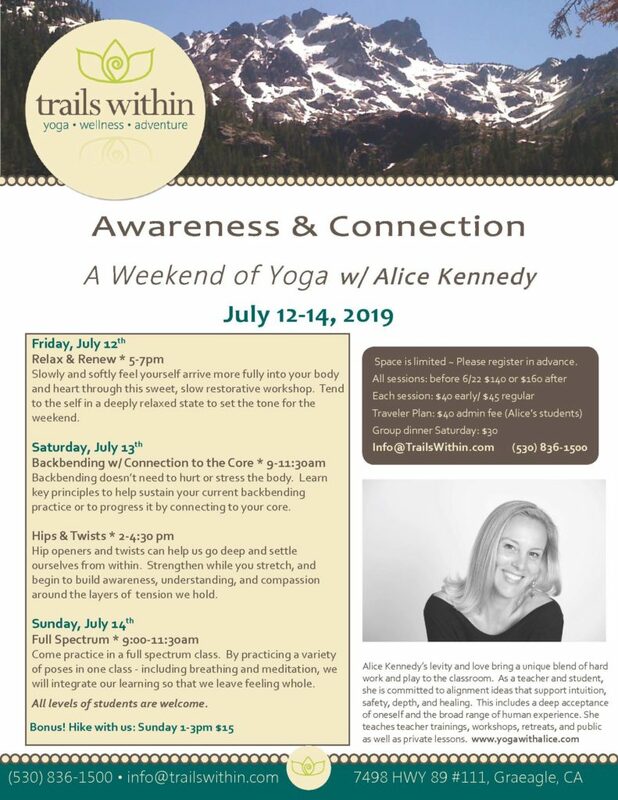 This workshop will be a combination of acupuncture and restorative postures that specifically target meridians that need attention and nourishment during the summer months (specifically the heart and fire element). We fill focus on joy, connection, and centered transformation. 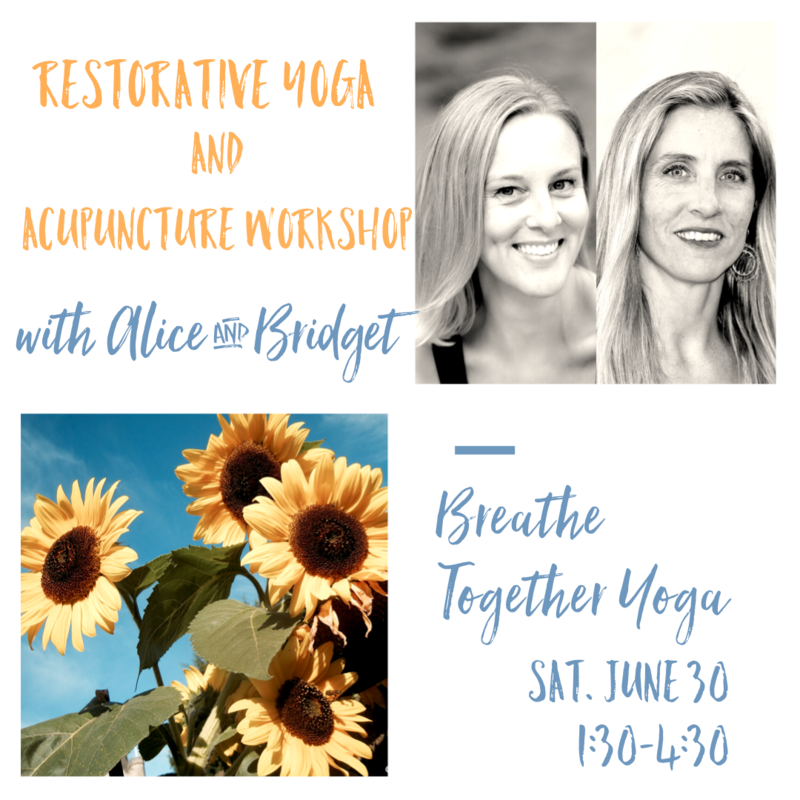 Alice will guide us into a restorative postures and Bridget will then apply acupuncture needles to the meridians supported during the poses. Several poses and a variety of meridians will be explored. At the end of the workshop, you will be imbued with essential oils that also support organ health and emotional well-being. You won’t want to miss out on this unique experience. Space is limited so please register in advance. Please wear loose fitting clothing that can easily be moved to both knees and elbows with a loose or v-neck. Core integration can provide confidence and stability to help your spine gently wake up. Without overworking, overstretching or forcing….our backs can happily open from a place of strength and ease, not fear. Hip openers and twists can help us go deep and settle ourselves from within. Strengthen while you stretch, and help let go of layers of tension and built up stress in the hips. If the past year or holiday season has left you feeling stressed, worn out, or uneasy….start the New Year by fully releasing the past and softly nurturing yourself in the present. By putting your body into gentle, supported stretches for a prolonged period in a safe and supportive environment, we will help to restore a deep sense of calm and ease to your nervous system so that you feel rested and clear to greet the New Year. A portion of the workshop will be dedicated to letting go of the past and embracing intentions for the present. Cash or check accepted as well. Contact me to arrange. This is a unique trip to the Leon Province of Spain, on the Camino de Santiago. We will spend a week immersed in yoga, community, and the art and culture of the region. We will also be able to get a feel for the famous pilgrimage of the Camino de Santiago. They say that whatever you need to learn, the Camino will provide it! Evening at the “Trechuro” for those who have the energy (very special artistic bar in the village usually with live music on Saturday nights)… doesn’t get going until 11pm though! 6:00 pm Evening in Astorga: Museo de los Caminos until 8pm. Free evening, dinner (not included) at a restaurant near the Gaudi palace, cathedral, and old roman walls. 12 pm Departure & Goodbyes! This restorative workshop will help soothe your nervous system and unwind completely in a safe and nurturing environment. By putting your body in gentle supported stretches for a prolonged time, together we will quietly help you feel more connected to the beauty of the nature around us and very calm internally. This is also a wonderful time to mindfully release any internal clutter you may have collected, so that your focus moving forward for the weekend is calm, clear, and unobstructed. All levels & therapeutic needs welcome. A standing pose and back bending workshop designed to build confidence, stability, and safety so that you can shine! Standing poses help cultivate confidence in the practice, while some people can shy away from bending backward. Back bending doesn’t need to be scary or painful….with awareness and alignment it can be fun, uplifting and transformative. In this workshop we will learn refined alignment principles to help open you without breaking you, so that your spine will feel pain free. All levels welcome. Hip Openers and Forward folds to help you turn inward safely and enjoy the refinement of deep opening in the lower back and hips. We will also work with some pranayama or breathing practices to help refine the breathe, steady the mind, and still distractions that can come up in life and practice. All levels welcome. What we refine in yoga is the relationship to oneself, and to the communities around us. This whole spectrum class will help with that journey of refinement and inquiry. Expect a fun filled class with a variety of poses and some time for self-reflection. Please bring a journal/paper and pen. All levels welcome. Space is limited ~ Please register in advance.